Long-Term Monitoring Surveys currently target 25 key species or species assemblages. Not all target species are sampled at each site. For more information regarding the sampling methods, please consult the Long-Term Monitoring Protocol (PDF link). Permanent photoplots are used to monitor percent cover of organisms within target species assemblages. Plots are established for a given species assemblage if overall cover at a site is sufficient for monitoring. In general, 5 replicate plots (50 x 75 cm) are placed in a stratified random manner throughout the target species' zone of maximum abundance. Plots are photographed in the field, and are scored for percent cover using a grid of 100 points, either in the field or in the lab from photos. A species, higher taxon, or substrate located below each of the 100 points is identified and recorded. Layering is not generally scored separately, so the total cover is 100 percent. However, there is an optional method for sampling photo plots that includes layering and spatial position. With this optional method, the top and bottom layers are recorded for each location on the grid. This provides extra data that can be used to gather information on species associations and small scale spatial changes over time. 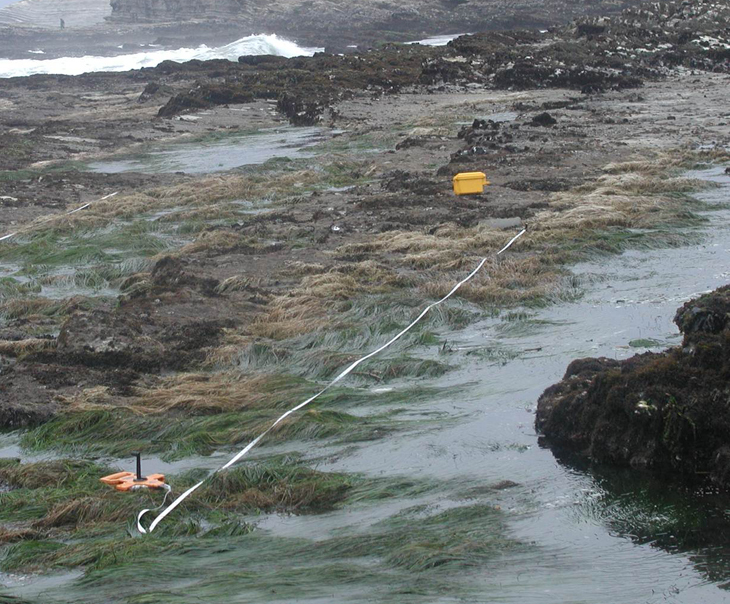 Permanent point-intercept transects are used to monitor percent cover of surfgrass, kelps, and other algae. In general, 3 replicate transects are established for each target species. Transects are generally 10 m long and percent cover is estimated by recording the taxa or substrate occurring under each 10 cm interval (for a total of 100 points). Species Count sampling is conducted by recording the number of a specific organism found in a permanent plot at a given site. For some species, at certain sites, size and health are also recorded. The type of plot and number of replicates monitored is dependent on the target species.